However, this is the story not of one man, but of hundreds of men caught up in what should have been an avoidable tragedy. It’s the tale of HMS Formidable, sunk by a U-boat on New Year’s Day 1915 with the loss of 583 men and boys. Although this figure is but a tiny part of the Great War’s inordinately high death toll, Dunn shows that these sailors lost their lives needlessly due to the Admiralty’s arrogance and ineptitude. As in his previous books, the author details how the attitudes and atmosphere of the “Vicwardian” period – where tradition and hierarchy were all-important, and notions of staunch heroism prevailed – were key ingredients in a disaster that was very much a product of its time. Dunn tells how the navy’s ships and commanders were ill-equipped for modern warfare, and how U-boat attacks in the early months of the war were often covered up or ignored. Vice Admiral Bayly, a “hard and unemotional” character, did not believe in a threat from submarines, so he kept his fleet at sea. Thanks to Dunn’s comprehensive research, he is able to set the scene in chilling detail – from the race to evacuate Formidable before she sank and the many acts of heroism on board, to the survivors struggling to stay alive in the storm-tossed lifeboats, to the bravery of the people, including local trawlermen and police, who helped rescue them. The stories of individual sailors make a 100-year-old tragedy seem very close indeed. But the sinking is only the first part of the tale; the book continues with an in-depth examination of how and why it happened, and what came next. There is damning evidence of the characters of men at the top – “personally brave but collectively ignorant” – and Dunn points the finger not just at Bayly’s own arrogance, but at the system that put him in charge. This gripping and affecting book more than fulfils its aim to be a memorial not just for the crew of Formidable but for all who served in the British Navy in the Great War. 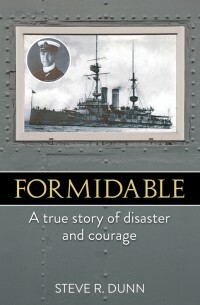 Formidable is available from Amazon and good bookshops priced £12.99.